Constant Troyon established himself as one of the most prominent members of the Barbizon School, a loosely associated group of artists working in the small village of Barbizon, France, on the edge of the Forest at Fontainebleau. His work took on international dimensions through exhibitions abroad, more so than any other artist connected to this group. His paintings were initially dedicated to the realistic depiction of the landscape, but after a decisive journey to Holland in 1847, he expanded his oeuvre and gained international renown by becoming an “animalier,” a professional animal painter. Troyon effectively used his previous experience as a landscape painter to situate his impressive representations of animals in their natural environment. Constantin Troyon, called Constant, was born August 28, 1810 in Sèvres, a town with a well-established porcelain tradition spanning several centuries. Both his father, a porcelain painter, and his mother, a burnisher, worked at the porcelain factory, and several accounts mention that Constant was born inside the manufactory itself, though he most likely just lived next door. When he was just seven, and his mother was working as a burnisher at the porcelain factory, he began studying under Riocreux, Troyon’s godfather and director of the factory, who would later also take on Troyon. He was not the most diligent student, however, and preferred to wander outdoors rather than sit for official lessons. Fittingly, he began his early career as a painter in the porcelain factory and would continue this until the late 1830’s, at which point he became a professional landscape painter. Troyon always paints beautiful, luxuriant landscapes, and he paints them in the role of colorist and even that of observer, but he always wearies the eye by the unshakeable self-confidence of his manner and the restless flicker of his brush-strokes. It is not pleasant to see a man so sure of himself. It was during this initial phase of Troyon’s career that he and other artists painting in a similar style, such as Théodore Rousseau, Jules Dupré, Narcisse Diaz de la Pena (a close friend of his), Alexandre Gabriel Décamps, and Jean-Francois Millet, came under fire for their unconventional technique in comparison to the academic landscape painters whose depictions of nature were steeped in mythological and historical imagery. These artists working together became important initiators of a new style of painting accepted at the Salon. They did not unify to become a “school” in the modern sense of the term, but did establish artistic communities in small countryside locations outside the capital. In The Barbizon School and the Origins of Impressionism (London: Phaidon Press Limited, 1994), Steven Adams notes that they had “One thing in common, their interest in native rural imagery, and this became one of the defining features of the informal federation of landscape painters that in the late nineteenth century came to be called the Barbizon School”. It is interesting to note that time and time again in the 1840s Troyon was taken to task for his use of coarsely applied pigment and the inappropriately large scale of his work. From the late 1840s however, Troyon’s work began to change. The paint, although by no means smooth in its application, was now applied in comparatively smaller touches; the technique is evident in Landscape, forest of Fontainebleau, shown at the Salon of 1848. Fancy the astonishment at the sight of Troyon’s animals, with their large life and their broad brush work in deep, pure colors, studied with discriminating sympathy for every race and species, and moving through landscapes of a master’s creation. These were not the fashionable stuffed beast, but living, moving herds. His animalier depictions became an instant success, and he exhibited his first animal painting at the 1849 Salon. This same year he was honored with one of the most coveted accolades, the Chevalier de la Légion d’Honneur, alongside his Barbizon companions, Jules Dupré and Camille Flers. Troyon continued work on landscapes and animal paintings, submitting regularly to the Salons. He also continued his discovery of the French countryside, and in 1852 traveled throughout Normandy working not on his animal paintings, but on seascapes of the Channel coast, a subject that became more prominent in his work during the latter part of the 1850s. He also went to England in 1853. While still strongly linked to Barbizon and to its painters, he returned there only occasionally during this period. In 1855, he was elected a member of the admissions jury for the Exposition Universelle. By this time, his paintings had become so popular that the works were sold even before they were begun. Four years later he exhibited at the Salon for the last time, Le Retour à La Ferme (The Return to the Farm), and afterwards only sent his works to provincial exhibitions and some exhibitions abroad, such as in Manchester and The Hague (1859), and in Brussels, Lyon, Bordeaux, and Besançon (1860). With his extensive travel and willingness to exhibit outside of France and in smaller cities, Troyon’s influence was widespread and he quickly gained a number of followers throughout Europe. He had more impact on artists outside France than many artists before him. His influence was also felt in France suggesting to Monet, one of his admirers, that he should his work en plein air, and taking in Eugène Boudin, after Corot advised him to seek Troyon out, as his student during his last period in Normandy. Troyon was also devoted to genre, as he and others of the Barbizon school took a stand against Rousseau’s rejection from several Salons. 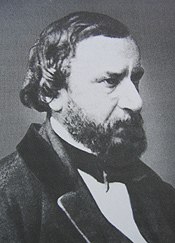 He also fought for liberal changes to the 1860 Salon, such as ending the Prix de Rome. Troyon was an important figure in the acceptance of landscape and animalier painting during the nineteenth century, opening the doors for the later Impressionist group to challenge the Salon establishment. Troyon spent most of his later years in Normandy, the Touraine, and the environs of Paris. He died on March 20th, 1865 after suffering a stroke that led to paralysis and dimini shed his intellectual capacity. Troyon was the first among the Barbizon artists to pass away; the Salon of 1866 paid tribute to his career.